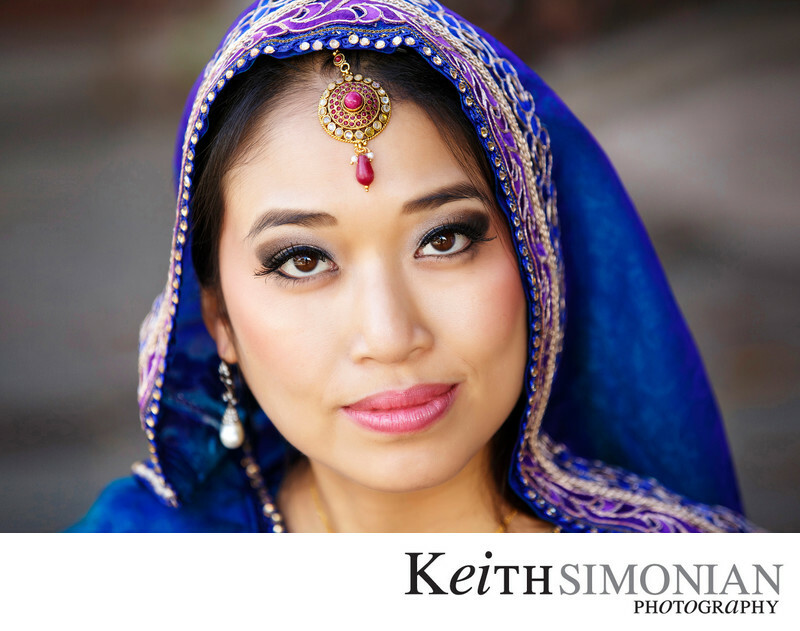 This San Jose bride is wearing a colorful blue wedding dress with gold colored inlay that sparkles in her eyes. Your job as a wedding photographer in the South Bay area is to capture those colors in a bridal portrait. Many times that portrait is going to be captured in the city where that lovely back light and clean background don't exist. When that happens as in this photo, there are several improvements that an experienced photographer can make. This image was captured with a longer lens at a close distance. That creates a separation between the subject and background. Even with the separation the longer lens gives, choosing a clean background is required to make sure nothing in the background stands out. Finally, you need to make sure the South Asian bride is in good light that captures her essence. Location: Ming's Chinese Cuisine and Bar 1700 Embarcadero Rd Palo Alto, CA 94303. 1/320; f/4.0; ISO 400; 145.0 mm.